The Firefly Summit 2017: Podiatric MSK is just around the corner – but the event promises to be a podiatry conference like no other. Aside from spending time in conference listening to the UK and Ireland’s leading podiatrists’ clinical gold, delegates will take part in adventure activities in the wilds of Ireland’s northwest. In recent weeks delegates have been telling us the adventure activity they wish to experience while in Sligo. The sold out event will see 200 podiatrists converge on Sligo, home to Firefly Orthoses and recently listed as one of Vogue Magazine’s favourite places to holiday in 2017. No ticket for the Firefly Summit? Don’t miss out, register here to gain digital access. 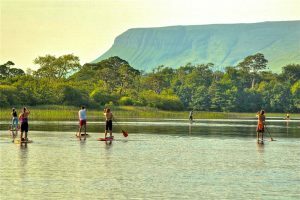 Ireland is renowned for its natural beauty with locations such as Kerry, Cork and Wicklow all noted for their scenic offerings but Sligo is growing in popularity all the time with more tourists making it their destination of choice. And Summit delegates will discover first hand, the breathtaking scenery and striking landscapes Sligo boasts. The most popular activity, as chosen by Summit delegates, is a hike up the historic Knocknarea. The hill stands 1,037 feet in height and is one of the most recognisable landmarks in the county with the prominent cairn of Queen Meave located at the summit. We have a special reward for those who make it to the top … an Irish coffee and some smoked salmon on brown bread. Mmmmmmmm! The second most popular activity chosen by delegates is stand up paddling [SUPing]. Sligo has many wonderful natural resources; Lough Gill and the Garavogue River that flows from the lake through the town to the sea are just two on our doorstep. The lake and river will be the setting for our stand up paddle boarders. The more adventurous delegates have opted for a dip in the Atlantic to experience one of the best coastlines in the world for surfing! Strandhill beach is now a major surf destination. A walk along the promenade reveals a variety of cars from across Europe with surfboards on roof or surfers squeezing into wet suits as they prepare to hit the water. Strandhill is quickly becoming a ‘must visit’ destination for surfers across Europe and further afield. The popularity of surfing has seen multiple surf schools pop-up along the beach, so novice surfers will be in safe hands during the Summit surf sessions. We know hiking, stand-up paddling and surfing may not be everybody’s cup of tea so for delegates who are seeking something a little more relaxed we are offering seaweed baths. Voya Seaweed Baths are located on the seafront at Strandhill and offer one of the most positively relaxing experiences possible. Bathing in a hot bath of seaweed is an incredible experience that soothes muscles, promotes skin regeneration and combats the effects of aging – and who doesn’t want to combat the effects of aging? The lady pictured bathing is 83 years of age – she takes a seaweed bath twice a week. "@CountySligoGC: West of Ireland entries close on Thursday for Rosses Point @CountySligoGC #Golf #Ireland pic.twitter.com/d1YfEf2ufO"
County Sligo Golf Club at Rosses Point is the jewel in the crown of the numerous world class links golf courses in Ireland. Besides the great views, the golf course offers an excellent challenge. The traditional links layout, designed by Harry Colt, utilizes the natural contours of the dune-covered landscape rather than moving large amounts of earth during its design. The end result is a course filled with dramatic undulations, elevated tees, and raised plateau greens. Wow! Excitement is building as we draw closer to the Firefly Summit 2017. We’re confident we’ve curated a podiatric conference that will expand delegates knowledge of clinical trends that continually reward the leading podiatrists in the UK and Ireland. But the Summit is also designed to ensure delegates experience all the very best that Sligo, the home of Firefly, has to offer. We can’t wait to welcome the 200 Summit delegates to the “land of heart’s desire”. As mentioned, the Firefly Summit 2017 is sold out however, you can sign up for digital access to the podiatry event of the year. Just click/tap the button below.